Reflected Networks Review 2019: Is Reflected Networks a Good Hosting? Reflected Networks is not your typical self-service shared web hosting provider. It’s a managed hosting and CDN content delivery company for global businesses. Reflected Networks is a managed hosting and CDN content delivery company that was founded in 2001. This is not a traditional shared web hosting provider, it operates at a lower level than that, so be prepared for a pretty technical ride in this review. Based on the toll-free telephone number, I’d say that this company is located in the United States, but this is not entirely clear from its website. I can, however, tell you that there are four data centers – in the U.S.A. and the Netherlands – which provide managed hosting, dedicated hosting, and cloud storage solutions to businesses in the United States and around the world. 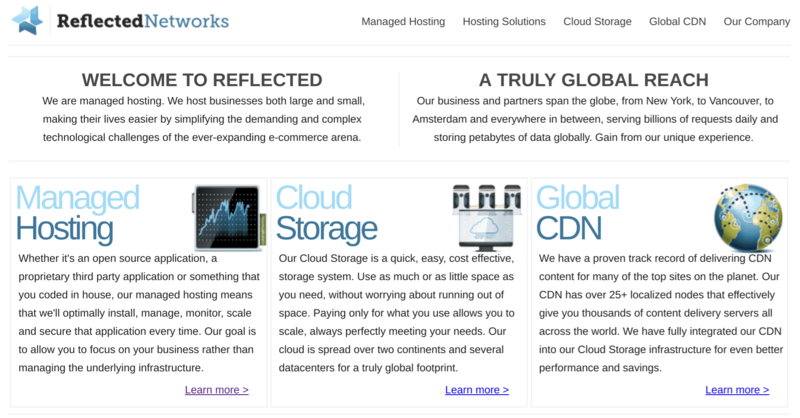 Reflected Networks has implemented cloud storage infrastructure in data centers located in two countries: the United States and the Netherlands. These data centers are based on the Dell EMC Isilon scale-out network-attached storage platform that provides storage, backup, and archiving of unstructured data. What’s more, the two data centers are equipped with redundant load balancers so that your cloud storage can be replicated in both data centers. The managed hosting solution helps keep your servers running and performing optimally. Reflected Networks takes responsibility for the installation, management, monitoring, scaling, and security of your server infrastructure at all times. And, to better facilitate high content delivery, this company has deployed a fully-redundant cloud-to-CDN system. One of Reflected Networks’ outstanding hosting offerings is its powerful load balancing solution that runs on commercial off-the-shelf hardware products and allows the vendor to leverage the performance tuning of its Linux kernel. Since Reflected Networks offers managed hosting, dedicated servers, and backup solutions to big businesses (rather than simple shared hosting for retail customers), its website displays no prices. So, you’ll have to contact the company to get a quote. This company claims to guarantee 100% connectivity with zero chance for downtime for customers that have two or more network connections in the vendor’s data center facilities. It also provides a 99% uptime guarantee for content delivery services, with appropriate compensation. There is no advertised money-back guarantee, but this is typical for managed hosting and dedicated server offerings. There is no public ticketing system or live chat support, but there is a toll-free telephone number. 24/7 support is provided to signed-up customers, but I tested the support team’s responses as far as I could as a non-customer. 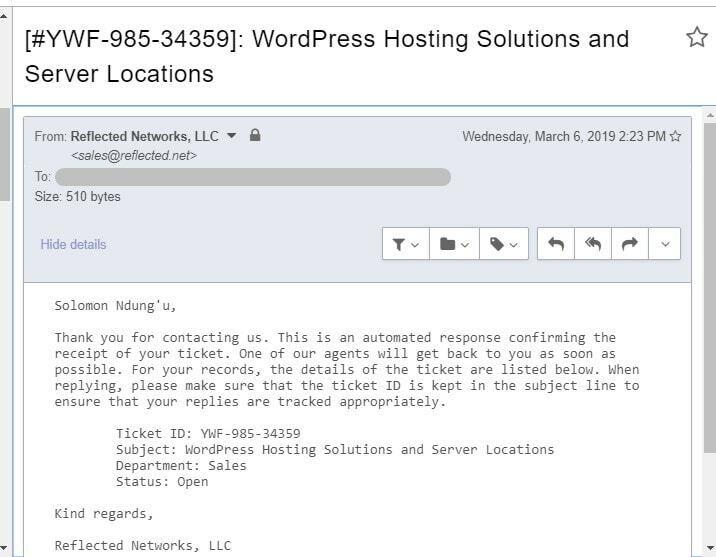 I sent an email, received an automated response promising to get back to me soon, and then… nothing. There is no knowledge base for self-support, which is understandable since this is not a self-service hosting provider. Reflected Networks has built a reputation as an excellent managed hosting and CDN solutions vendor. The company has created practical hosting solutions for fast-growing businesses through its cloud hosting offerings. However, if you’re looking for simple shared hosting plans that you can purchase entirely online, you should be looking somewhere else. For fully managed hosting and storage, see Reflected Networks. Wondering how Reflected Networks stacks up against other Web Hosting companies? Enter any other Web Hosting company and we will give you a side-by-side comparison.